Many modern interior flush doors have a hollow core often consisting of little more than a honeycomb of corrugated cardboard to provide rigidity, and a thin plywood skin covered in a vinyl or foil decorative finish. The latch stile of the door (the edge which swings) will usually contain a “lock block”, a solid block of wood to provide a location for mounting the handles and the lock or latch. The lock block can be quite small to save on manufacturing costs and if the door has accidentally been hung with the hinge side (the hanging stile) on the swing side, there may be no lock block to find at all! If your handle fixings either miss or have not secured well into the lock block and become loose, the handle will be loose on the door. Left unfixed, this will put strain on the lock/latch follower and risk damage to both the lock/latch and the door face. 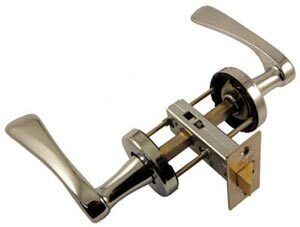 Sometimes handles need to be fixed in the same location where the lock or latch has been fitted into the lock block, typically round rose interior handles. In this situation the timber for the fixing screws will be very thin giving a poor fixing for the screws to bite. Match sticks, fillers and plugs may all help, but the best solution is to use a bolt through fixing (sometimes called a back to back fixing). These effectively secure the handle and transmit any pulling force to the handle on the opposite side of the door providing a strong and secure fixing. 1) Using round rose handles: The lock or latch will likely obstruct any fixing screws resulting in too little wood to achieve a decent screw fixing. 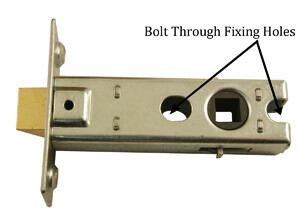 In this case you need to use bolt through fixings together with a lock or latch which has pre-drilled through fixing holes. These holes can be found in the positions shown on the images below. 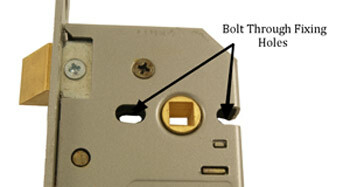 If your lock/latch does not have these holes then you will likely need to change them for ones that do. 2) Fixing screws have pulled out and no longer bite into the timber: Check that the screw has actually been screwed into the lock block and not a hollow part of the door. If a lock block is present, you may find that placing a match stick into the fixing hole may allow the screw to bite again. If not, and you wish to achieve a more secure permanent solution, fit bolt through fixings. This will also be a desirable resolution should the door be hollow at the fixing point i.e. the screws have missed the lock block. 3) Screw heads are exposed on the handles and any fixings need to match the finish: Exposed screw heads will likely be 6 gauge raised head countersunk screws where the face is rounded over instead of flat. This is not a problem at Bernards Door Furniture Direct who sell a unique type of back to back fitting. 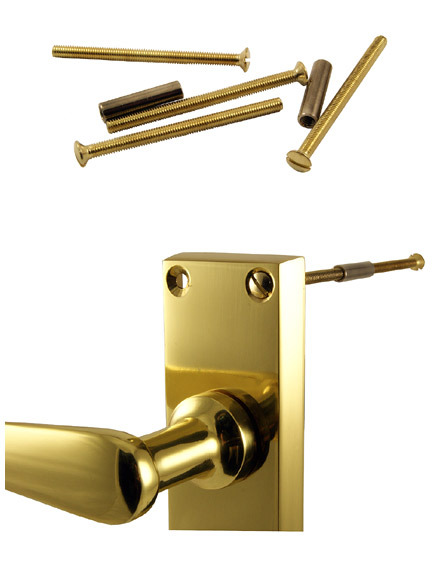 Whilst many bolt through fixing sets on the market are flat countersunk screws which are the wrong size and finish, Bernards Door Furniture Direct produce a range of fixings in different finishes to match your handles. These feature M3.5 countersunk raised head screws in polished brass, polished chrome and satin chrome. The screw heads will be a close match to the style and finish of a 6 gauge raised head wood screw making it possible to secure your handles in the best way possible and they will look good too.